In this guide, you will learn to create an extension for Microsoft Edge. This example extension will allow you to manipulate specific CSS for docs.microsoft.com pages -- walking you through creation of a manifest file, the user interface, and background and content scripts. This tutorial assumes you have basic understanding of what browser extensions are and how they work. Unfamiliar with the building blocks for extensions? Check out Anatomy of an extension. The code for the full sample is here on GitHub. To begin, create a directory for your extension and name it "color-changer". Inside the "color-changer" folder, create a file named "manifest.json". The "manifest.json" file is required for all extensions and provides important information for the extension, ranging from the extension name to its permissions. This guide will walk you through all the manifest keys you'll need for this tutorial, but for a list of all supported and recommended manifest keys, see Supported manifest keys. Inside "manifest.json", include the following code. permissions: an array of strings requesting permissions for the extension. For this extension, we're requesting permissions to see the websites visited ("tabs") and to read and change content on URLs matching "*://docs.microsoft.com/*". Now that we've created the manifest file, we need a user interface for the extension. For this extension, we will create a popup for the user interface, like below. In "popup.html", we create a title, a paragraph, and three buttons (Aliceblue, Cornsilk, and Reset). Now create a folder called "css" and inside create a file called "styles.css". Add the styles below. This CSS gives our extension some basic styles. Feel free to add more styles to customize your extension. In "popup.js", the tabs API allows us to interact with the browser's tabs and inject script and styles into their page content. Using the tabs.insertCSS() method, we inject the specified CSS into the page which changes the header on docs.microsoft.com to a different color when the specified button is clicked. Now that we have the basic popup functionality, let's add icons to the extension. Icons are used to represent the extension in the browser toolbar, the extensions menu, and other places. The icons you need for this extension are here on GitHub: images. Visit the Design guide to read more about extension icons in Microsoft Edge. After you've downloaded the extension icons, save them in an "images" folder inside "color-changer". The icon that appears in the toolbar is set using default_icon inside of the browser_action key, which we already added to our manifest file in an earlier section. The icons key defines which icons should be used in the Extensions settings menus. Below, we are specifying multiple icons with different sizes to account for different screen resolutions. The name of the icons, "25" and "48" are the icons' heights in pixels. icons: specifies the icons for your extenion with key-value pairs of image size in px and image path relative to the root directory of the extension. You'll noticed icons named "inactive##.png" included in the images folder -- we will use these later in this guide. Now that we've added the user interface and created icons, let's test the extension. Walk through the steps for Adding an extension to Microsoft Edge. Then, come back to this guide. After you've added your extension, navigate to any docs.microsoft.com page. You should see the following popup after clicking on the browser action. The color of the docs.microsoft.com body should also change color. If you encounter any errors or functionality that's not working, check out the Debugging extensions guide or download the full sample here on GitHub. Let's go one step further and add logic to disable the extension from working on pages outside the docs.microsoft.com domain. To do this, we first need to create a content script. Content scripts run in the context of a particular web page, can access the content of a web page, and can communicate with background scripts, which we will create shortly. Inside of your "js" directory, create a file called "content.js". Add the following code. This script gets the URL of the current page through document.location.href and checks whether or not the current page is on a docs.microsoft.com domain. If the page is not on a docs.microsoft.com domain (e.g. https://www.bing.com/), the paths to the inactive icons (grayed out icons) are sent to the background script using runtime.sendMessage(). Next, we need to create a background script. Background scripts run in the background of the browser, run independently of the lifetime of a web page or browser window, and can communicate with content scripts. The runtime.onMessage method listens for runtime.sendMessage() from the content script. If the page's domain is not docs.microsoft.com, then browserAction.setIcon() sets the icon paths to the inactive images. This script also disables the browser action (browserAction.disable), so that users cannot click on the browser action outside of a docs.microsoft.com page. persistent (required): This can be either set to true or false. If set as true, the background script will be loaded and continue to persist for the entire browsing section. If set as false, the background script will be loaded with a delay and will then persist for the browsing session. Reload your extension and test again. 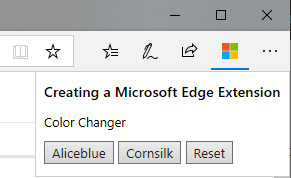 To reload your extension: click the "..." for settings and more in Microsoft Edge, click "Extensions", click on your extension, "Color Changer", and click "Reload extension". Now, open a new tab or refresh an existing tab that's not a docs.microsoft.com page. You should see the inactive icon and not be able to click on the browser action. Congratulations! You've created an extension for Microsoft Edge! View the full sample here on GitHub. Continue reading to learn more about extensions. Want to write a more complex extension? Take a look at MDN's Beastify extension in the article, Your second extension. Microsoft Edge's extension model differs slightly from Firefox's, so we've adapted the Beasify extension created in Your second extension to function in Microsoft Edge. Check it out on GitHub. While walking through MDN's article, Your second extension, keep in mind the following sections. See the Supported APIs page for a list of supported extensions APIs in Microsoft Edge. Preferred extension icon sizes for Microsoft Edge are 20px, 25px, 30px, 40px. Other supported sizes are 19px, 35px, 38px. For more info on icon sizes and best practices, see the Design guide. You can walk through the Quick Print example in the video below. Head over to MDN web docs for more information on Browser Extensions.